The recent outperformance of US natural gas over crude oil has been quite spectacular - some 25% just since the beginning of March-2013. As usual, we want to understand the fundamentals behind this divergence. Natural gas of course is primarily used for power generation and heating in the US, while crude oil demand is driven by other, more global factors. We've discussed the recent weakness in crude oil earlier (see post). The strength in natural gas on the other hand has been impacted by two key developments. 1. 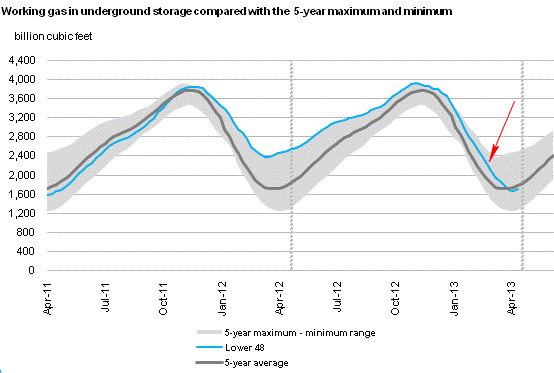 The warm winter of 2011-2012 caused a large build in inventories, which ended up weakening natural gas prices. In areas like the Northeast however (and some other regions that rely on natural gas for heating), the warm weather pattern has been reversed this past winter. 2. Faced with a glut of gas in storage and protracted price weakness, energy firms such as Chesapeake Energy have curtailed production - as can be seen in the recent trend of rig count. ... and pushed natural gas prices comfortably above $4/mmBtu. These higher prices will now halt and possibly reverse the declines in gas rig count and spur more activity in natural gas production. It may take some time to get to a balanced state, given the rapid changes in the US gas industry (see discussion). The oil-gas relative divergence however has likely played out its course for now.